Our Moda Bakeshop has gathered up 22 of our popular “chefs” to create this big, happy book full of projects to make for just about every imaginable occasion. Over 40 themed designs work with Moda precut fabric bundles (or any other fabrics you like) and range from easy to more challenging. This book will surely get you in the mood to sew and make every celebration with your family and friends even more special with delightful handmade gifts and décor. This fabric cook book is filled with adorable projects for every season of the year! Like this jolly Ho! Ho! Ho! quilt that we absolutely love. Each project uses Moda Precuts which make it faster and easier to whip everything up. you’ll find something pretty and practical to make for every event on your calendar. We love this wreath & set of Christmas trees and thought how fun it would be to have a “Christmas Tree Decorating Party” with your fabric loving friends! We are giving away a jelly roll to one lucky quilter & we encourage you to have some fun with your friends and see which of you can come up with the most creative MODA tree this Christmas. These trees would look adorable with multiple colors/prints and even in the ever popular, Ombré! * Winner announced tomorrow at 9am central standard time. Previous Previous post: 12 Moda Days of Christmas Starts TOMORROW! I’m a sucker for Christmas quilts and the ho, ho, ho one would be adorable as a gift. Count me in for the giveaway! It will be great to have a gift that allows me to gift back to other people by making them some awesome things! Thanks for the chance to win I am a follower! I want Santa to leave this book for me ( or for you to give me one!) because I have been SO nice this year! Really! 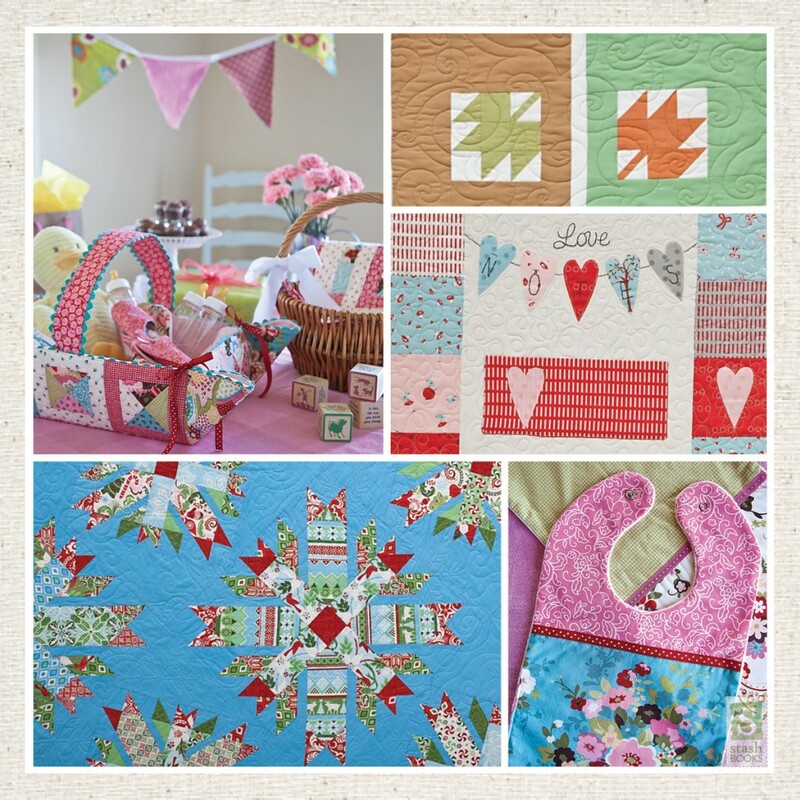 I’am a Dutch quilting girl and please count me in for thismmost lovely giveaway. I tell everybody in the Netherlands about Moda’s most friendly Santa Claus. The tree and wreath are really cute. Love the quilt, too. I’ll look for this book! I love moda fabric the book looks like a good way to use my fabric. Thanks for the contest. Oh perhaps this book would help me to start early with my sewing and quilting so that I actually have finished gifts for christmas!Lol! Every year I am just behind…. Santa needs to leave the book and JR for me because he knows just how great that quilt would look in my granddaughter’s room – perfect! What a wonderful book and generous giveaway! I would love to be your winner, especially on December 1! I love today almost as much as Christmas because it is a magical start to a month of family, friends, and magical moments! And I am so ready to make a new Christmas project from the book and there is lots of time to do it! Dear Santa, please put me on your Nice list. There were a few little, very little, slips – not quite naughty. I will do better and I do so need this book. Ho! Ho! Ho! The book and JR would be great to to gift back to other people by making them some wonderful things! Thanks for the chance to win I am a follower! I just made my first stocking this year and would love to have this book in it! The projects look great. I would love to win this gift because the HO HO HO quilt would be a wonderful one to start 2013 projects and an early Xmas present would be sew nice. I’m hoping to get EQ7 this year – hope I’ve been good enough! Santa should leave this gifty in my stocking because I asked for this book AND you can never have enough Bella jelly rolls! It would be a joy to make a HO HO HO quilt! I love Christmas! Oh boy…Santa really needs to leave me this so I can make that HO HO HO quilt! I LOVE it!! Thanks for the chance!! Santa knows this book would be an asset to my collection of quilt books and he knows I don’t have enough colors of green in my stash. I’ve really been a good little sewist…that’s why Santa would want me to have this great prize. AND, I just have to make that HO…HO…HO quilt for my grandson! Sharing this on my blog today! Just bought my first sewing machine – can’t wait to get started learning, and sewing! It looks a great book and green is my favourite colour! I’d love to make the wreath and trees! I’m hoping for a Grinch free Christmas and these goodies would help me to run up some festive cheer and make sure the Grinch gets banned! It looks like a great book. I am a newbie quilter and would love to make the ho ho ho quilt. I’ve been eyeing this book and would love the ideas for all the different holidays!!! Thank you for the great giveaway!! I love the bright colors of Christmas . This book shows them off. It would be a great present . The projects are unique and fun. Thanks for the chance to win ! Oooo, I’d love Santa to leave this in my stocking because I love to make Christmas gifts. I’m always looking for something unique to make as Christmas gifts — there are some really cute ideas here! I want Santa to leave this in my stocking because Moda fabrics are the best; the book will be handy to find a project to use this fine fabric. I would love to have this giveaway! One of my favorite things to do for the holidays is actually make gifts for my family. This would be perfect! I’ve been eyeing this book and it looks like it’s full of great projects. And who doesn’t need (want) a beautiful jelly roll!? Thank you so much for the opportunity! I’ve got your first book and love it! I’d love to keep my collection going!! Thanks so much for this givaway!! Moda IS my favorite color!! love the book — and love the fabrics! who wouldn’t want to find this book in a stocking?? I would like to win so I could try those Christmas trees. Never seen anything like them and think they look effective. It has been a difficult year over here and this would be a welcome gift. I loved the last book and I’m sure this one won’t dissapoint! So, Santa, leave a present under the tree, for me! I’ve been an awfully good girl, Santa Baby so hurry down the chimney tonight! I love the Ho Ho Ho quilt! There must be much more fun projects inside and I am eager to find out. I’m a Christmas junkie so ANYTHING Christmas is up my alley, especially home made. I’ve been SUCH a good sewist this year, making all sorts of goodies for friends and family…and myself. I would love for Santa to fill my stocking with this book, so I could have lots of ideas for what to make next year! I love the ideas in this book! MERRY Christmas to all of you! If I am busy sewing, there is no time to be naughty so Santa should be good to me. Merry Christmas! Because I’ve been good, and I DESERVE this!! I would use this to make some pressies for my dear ones. So, not only would you be blessing me but also many others. I’m a follower, and who can’t resist some Moda pre-cuts! I love Moda. This is a great book! I think I’m addicted to Moda pre-cuts – I look for them every time I visit a quilt shop and shop online. I always love to sit down with a great quilting book and add fabric to my stash! My true love (moda) gave to me, Moda’s new book! I would love to have this book…so ready for something new and pre-cuts are just what the quilt fairy ordered. Thanks for this offer. I would love to win the book and roll so I could make a wreath for my son and DIL who just moved into a new house. I fell in love with the HO HO HO quilt as soon as I saw it. I am a follower and will be until the end. I would like Santa to leave me the green Jelly Roll so I can get a jump start on next year and make that adorable green wreath. Thank you for the 12 Moda Days of Christmas and giving all of us a chance to win. Dear Moda Santa…I’ve been a very good girl this year. Please think of this Texas Gal for this First Day of Christmas GiveAway! Santa knows I have been good!! Since i am the primary “agent of Santa” in our house – my stocking is frequently a bit floppy and empty. This would fill it nicely!!! I would be celebrating if Santa put this book in my stocking! Thanks for the giveaway. I would love Santa to leave this in my stocking, to further my addiction to all things MODA. I absolutely love the Moda Bake Shop! I have just started making handmade things this year for Christmas, and evetually I would love to have an all handmade Christmas! This book looks amazing! Christmas is always fun to sew & craft for – I would love the green jelly roll to make something new this year! The book looks amazing, too. Thanks for the chance to win. I would love for Santa to leave this under my tree because I have lots of Moda pre-cuts and don’t know what to do with them! 🙂 And I have a jelly roll that the green would go perfect with! Would love some more ideas for the precuts that I’ve got. I Santa to leave this in MY stocking so I can make that perfect HOHOHO quilt!! I love it and I love my Moda’s!! I need to win this book because I need to make some new holiday decorations to replace some very tired ones! The book looks like such fun and the jelly roll is in a color I seldom use. It should serve as a kick in the pants for jump starting creativity! I need this book because I don’t have it. I love the Ho! Ho! Ho! quilt! Thanks for the chance to win! I’m a new quilter so I need lots of ideas and inspiration to decorate my house year round. Thanks for the great holiday gift! I’m a member of a smocking guild but we do so much more than smocking. We are always looking for new ideas to try out at our meetings. This book looks like it is full of fun ideas. My stocking would need some solid fabrics and precut,books and tools. I’m crazy for Christmas, but I’m even CRAZIER for Moda! Would love to win this giveaway! Santa, please leave me the jelly roll, I have been a very good girl, and I can’t have the Chocolate you usually leave.. I’m on a diet! I would love for Santa to leave those in my stocking because I would love to be able to make that green Christmas wreath. It would look perfect on the back of my door. Santa needs to leave me the jelly roll and Sweet Celebrations book because I have thought a fabric tree would be cute on my mantle for the last ten years and still don’t have one. This would finally get me that tree. Oh Santa baby hurry down the chimney with Moda for me! And thanks! Ho ho ho-ly mackarel! Do I love the green. Santa can leave me a roll of green anyday to play with. Green goes with everything. Would love this in my stocking because if I’m ever able to sit with my dear friend (my sewing machine), I need something like precuts and projects to help me along! It is on my wish list, and I have been mostly nice this year! Love that green! 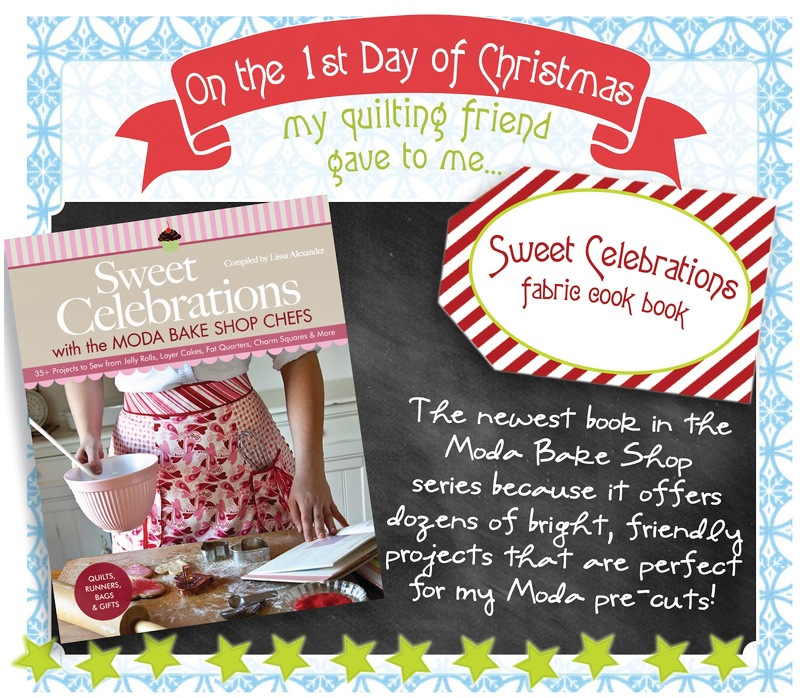 What a fun book with some great projects – you sold me with the Ho Ho Ho quilt! 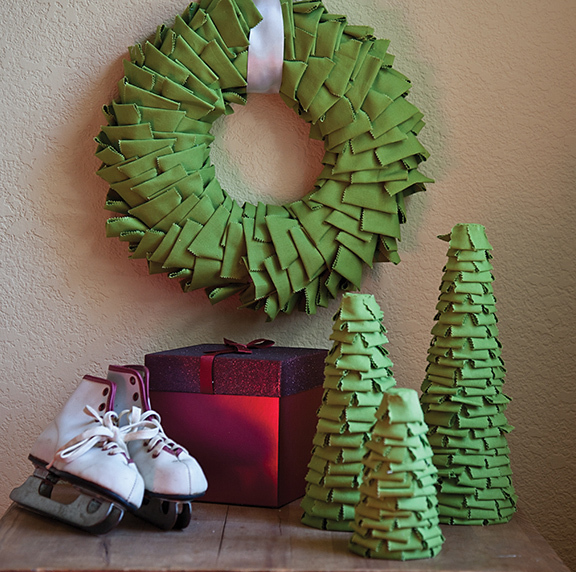 A green jelly roll would be just the thing for our green Christmas up here in the Pacific Northwest! I am getting more confident in my sewing and have started making projects other than quilts these days – this book looks like it would be oh so fun! And a green jelly roll!??!? Who wouldn’t love that? Thanks for the chance to win! We just bought our first house this year and I need to build up my holiday decorations. Oh, the book looks great! I love the green jelly roll. The tree project looks fun using the jelly roll. I would love this book with both baking and sewing. I would be fun to make the HO HO HO quilt! Thank you for the opportunity to win. The green roll speaks to me..listen closely…win the book and be inspired to create with me…. I love the projects I’ve seen so far and can’t wait to see the rest of the book! I really need to win this gift as my house has been packed up since LAST summer (waiting to move) and I haven’t been able to sew or craft since then … going NUTS here!! Thanks for the opportunity to win!! I would love some new “fresh” ideas for Christmas projects. Thanks for the giveaway. Ho Ho Ho – Santa dontcha know – I’ve been good, just like I should – please give me a chance, to do the Jelly Roll Dance…I’m sure with the book, with the fabric I’ll cook! I want to make one for each of my 2 nephews — but, I have to start now, they only have a couple of years left to believe! I would love this because I’ve been such a good girl and I would be willing to share….. I love the Moda Bake Shop patterns. This book would be used over and over, because the patterns are all so fabulous. Thanks for sharing a copy. I’d love to win because green is my favorite color. Any gift that allows me to make something for somebody else too is a win-win! Thank you for the chance to win! I bought the first Moda Bake Shop book and I love it! It would be fun to win this and have my grand kids help me make the trees or the wreath. Thanks for the chance! I want Santa to leave this for me so I can make the cute apron for my mom and the quilt for my bed! I want Santa/Moda to leave this in my stocking so I can make Christmas jolly all through my house. Hope I win ! I really think I need that Ho Ho Ho quilt on my bed. It makes me smile. Oh Santa…you know I follow you happily and I would be SEW happy to find this in my stocking. You know I have been good ( most of the time)!!!! Ooo, I would love to use that green jelly roll to make a fabric wreath! Looks like a fun book! I just love everything by Moda Bakers 🙂 and that Ho Ho Ho quilt is wonderful! 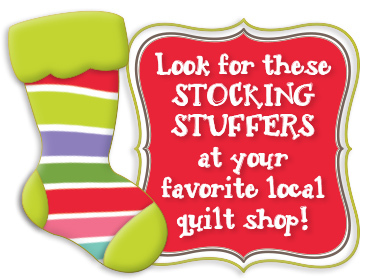 I hope that Santa leaves a gift certificate to the fat quarter shop in my stocking! I want to win because I might actually perform my own Christmas quilting miracle and get that Ho Ho Ho quilt done by Christmas! Thanks! I follow your blog, and I think Santa should leave this in my stocking because I love everything Moda. Who knows? I might even make something for “Santa” if I win. Thanks so much for the chance to win!! What a great giveaway! Santa Moda is such a nice person and this little quilter could use some cheer in her life! Ho, ho, ho! Your preview of the book makes me want to win it. It looks to be check full of great gift ideas. I want Santa to leave this for me because I LOVE Moda fabrics. They are the softest cotton fabrics I’ve found. I have been a good girl this year and I would be so excited to receive this awesome book and gorgeous fabric so that I could share the love and make gifts for all my family and friends for every occasion! Thank you for the chance to win! I would love to win the givaway. Not sure what I would make but I am sure my little brain would find something. Please find a way to put this book in your sleigh and then into my stocking on Christmas Eve please! This book would help me continue to give gifts to the special people in my life and the jelly roll would help me to make another special quilt for my husband as green is his favorite colour…. Take care during the stress of getting ready for your big sky trip! I would want to win because it is a fun book with fun quilts! It is all about the fun and warm hearts that come with Christmas and blog giveaways. Thank you for this one. What a lovely give-away. Thank you for the chance! I’d love to win this so that I could make that tree and that Ho Ho Ho quilt for my daughter and her new husband. Newleyweds in need of Christmas decor! I would love anything by the Moda bakers—-jelly rolls, honey buns, turnovers, candies, dessert rolls! All of it is just scrumptious to me! I’ve been very good this year! What a great give-away! Thanks for the opportunity! Of course I am a follower! I would love to win this book! Please leave the fabric roll in my stocking for me!! Oh Santa! What an awesome gift this would be! I love the HO HO HO quilt and would immediately make that for my grandson. And the green? I love green! That would turn into some trees pretty quickly. Thanks for the chance! I love sewing for holidays, so I would be thrilled to a win a copy of this book! I love Moda fabrics and this would be a great present for me! 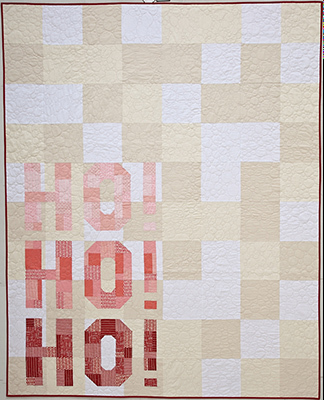 that “Ho, Ho, Ho” quilt is fabulous! If I won this, I’d be starting that one right away! Thanks for the chance! I love using Moda pre-cuts! Surely Santa would know this and want to leave this book and jelly roll in my stocking! Pick me! Pick me! I’ve been a good girl this year. I’d love to find this jelly roll and book in my stocking so I can give these cute cute trees a try. I just love new Christmas decoration ideas. I would love this simply because Santa isn’t coming to the adults in the house this year. I would LOVE to win the book and the jelly roll. I need some new projects for 2013. Thanks for the chance to win! this would be great for finding ideas for making gifts! I would like Santa to leave me these presents so I can get started making some presents for other people…for next year, of course! Still am working on a few for THIS Christmas! I would love to have this prize in my stocking to share with my granddaughter when we sew together. Thanks! I love moda fabrics and patterns. Bakeshop always gives me inspiration. I would love the fabric and book to make some goodies for my family. They are my favorite quilt recipients. Thanks for the chance to win. I will love to get this present so I can get my creative juices flowing! The Ho Ho HO quilt is adorable! I would love to win–you can never have too much holiday stuff around!! I would love to have this book! I follow most of the chefs’ blogs and have been seeing previews for months. I really like the idea of having projects finished for each season. I would love to find the book and jelly roll in my Christmas stocking tomorrow. One of my favorite sites is the Moda Bakeshop. Its a great place to go for inspiration because my favorite color is Moda. All things Moda. Plus I adore that Ho Ho Ho quilt! Its beautiful. I would love to win this as I do not have any books similar to this and the Ho Ho quilt is calling my name. I’ve been craving this book since it came out and I loooooove jelly rolls and I’ve been SUCH a good girl this year! Because I would be a good girl all year long !!! Oh, I so love Moda and all your patterns. I would love to own this book and green happens to be my favorite color. And I have just the right Christmas fabrics to add to it to make some of the amazing re pies in this book. I am learning to quilt and would love to find this jelly roll and recipe book in my stocking…..Yum!!!! I like to look at your blog entries and the color-filled pages. I am driving my hubby crazy while dreaming of fabric and piecing. Thanks for offering these great giveaways! That book looks wonderful! I really need it along with that green fabric that I can use for some ornaments. Santa needs to leave this in my stocking, because there is no such thing as too much Moda! I am looking forward to making up some of these great recipes. 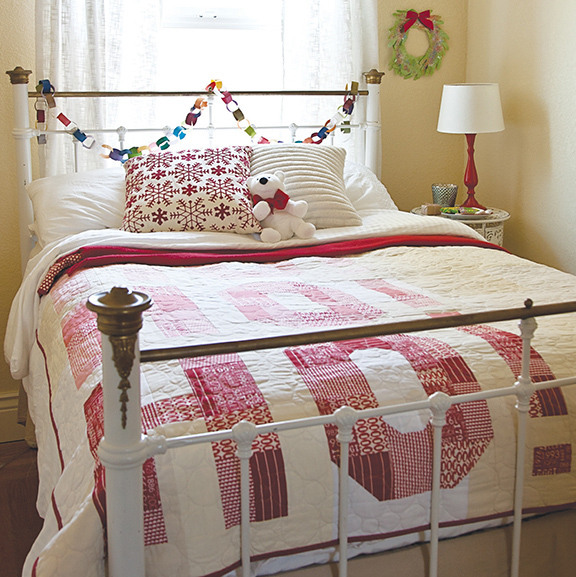 I love that Ho Ho Ho quilt, so simple. 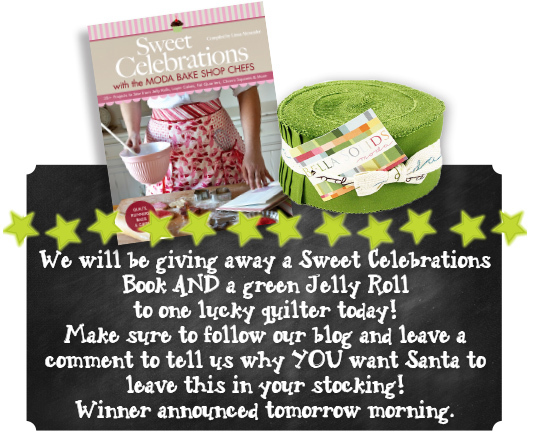 I would love to find that green Jelly Roll in my stocking! Please Santa, fill my stocking with these great gifts! I would love to find this in my stocking so I can finally decide what to do with all my pre-cuts! I’m teaching a few young people how to sew and quilt. Bake shop projects make things so much easier, and would love to share this with them. Santa should leave this in my stocking because it would make me happy. He already knows that because it has been on my list since the day it came out. If Santa leaves me this project book my husband can not be mad at me for shopping for it myself. I don’t have any Big Christmas quilts, but if I had this book, I would sure make that HOHOHO Quilt. I’d love a stocking for myself that would let me indulge myself creating gifts in my sewing room. Would love Santa to leave me the project book and maybe a prepaid card to purchase tons of fabric!! I have tried to be a very good quilter this year. This book would help me(I only have 1 quilting book) and I’m sure that it would be well used. I’m in the planning stage of a king size Forest theme quilt for DH and the green jelly roll would fit right in with the color theme. Plus, Santa, I have never had a Jelly Roll. Well….I have been very nice this year and only a tad naughty, and it would be sooo much better than receiving a lump of coal. Santa would love for me to have this prize so I can make some gifts for others! Santa, I love all things Christmas, so I need this book! I’ll be sure to leave some really good cookies! I’ve been good this year- I only have one UFO to finish and I really need some new books for the shelf in my sewing room. Getting older so trying to do more with pre-cut fabric so don’t have to bend so much. I need a Christmas gift just for me! Ho ho ho! Happy Holidays and thanks for the opportunity to win! I’m a new follower and that looks like a great book & the fabric is a bonus! Thanks for the give-away chance. This book would give me so many great gift ideas! Thank you! I make new Christmas items for my children each year. I have even started Christmas boxes for my GC and GGC. When they start their own household they’ll have tons of Christmas treasures. I saw previews of this book on an earlier blog hop and it looks wonderful! A gift from “Moda Santa” has to be the best kind and I would be thrilled to win. I would love this jelly roll and yummy looking quilt book because I’m all about food. It would keep me enthralled in sewing projects and away from the Christmas treats!!! It would be a sweet gift and I green is my favorite color! I love precuts, and this book would give me some great projects!!! Oh what a delight if Santa left this book for me. My boss said she would love a new Christmas Quilt but doesn’t have time to make one. The HO HO HO would be perfect and I’m sure I could find the time to make it. I’d love this in my stocking to keep me occupied in the year ahead and I have a pile of precuts that I should use up before I buy more fabric! I’m new to quilting and a book of lots of different types of projects would help me learn. I also especially love working with precuts. That is probably why I started quilting in the first place. I’ve just moved countries and opened up my boxes of fabric so I know I don’t need any more. If he could leave a whole lot of spare time in my stocking so I could do something with all that fabric, that would be great. Do you think he could?! I love precuts and Christmas trees. I would love to make this one with your green jelly roll!!! Santa knows what a good girl I’ve been this year. I just know the book is something I could use for inspiration and from all I read, lots of goodies to make for my family too. I have 3 grandchildren I need to spoil and make stockings and other goodies for so this book would be perfect. And one of those grandchildren, my youngest one, an adorable little girl who is 9 months old needs Grandma to be happy and spoiled by Santa too. She thinks Santa should bring Grandma these goodies so she will get more from Grandma who will have more money if she’s not buying books and fabric for herself. I’ve been a very good girl this year & I know Santa comes to those who believe! I would love the Celebrations book so much so I could make our girls the Ho Ho Ho quilt. I will leave some thread on the counter for you! Dear Santa, I have been really good this year and I would love to make the tree and some of the other projects in the book. I love the Ho Ho Ho quilt. I want Santa to leave this book and the green jelly roll because he knows green is my most favorite color and I need to know how to make the quilt with the blue background. Moda Santa – My 7yo daughter & I LOVE to make projects together and the projects in this book look like things we would really enjoy making! I would love to win a copy of your wonderful book and jelly roll! Would love, love, love to make the holiday Ho, Ho, Ho quilt! So cute. Thanks for the chance! I would love to win and surpirse my college daughter on her first day home – she loves sewing and new projects! thank you! Santa probably should not leave this fabulous book and jelly roll at my house because I have books and material…but, oh Santa, I would dearly love to make some of these fabulous projects for Christmas gifts for others next year!!! Hi! LOVE all precuts! Thanks for sharing a neat neat BOOK+PRECUT TOO-I’d love to find these in my stocking! The projects are wonderful! Sign me up! That Christmas wreath looks adorable. I would love to win your giveaway, make the wreath, and give it to someone special for Christmas. Thanks for the chance! Oh that quilt! Ho! Ho! Ho1 I loveeeeee it! Santa please let me win! I would like Santa to leave these goodies in my stocking because I already have several projects picked out that I want to make for a new momma I know, and for MY momma, and for my sister, and for ME! I’ve been a really good girl, and I PROMISE to leave extra cookies for you when you come to my house! I can make a lot of gifts with this book and jelly roll. Thanks so much Santa!! Love the HO HO HO quilt. Going to check my fabric for that. Would love to win. Looks like a very fun book to own. I love to sew and always looking for new ideas. A very giveaway from Moda. I would like Santa to leave this in my stocking because, one cannot have too many Christmas ideas! OOHhhh this Ho Ho Ho quilt is just stunning,would love to make this one up for next year.You guys come up with the best recipes! 🙂 Barb. The book looks amazing and the roll would brighten up a Christmas table runner that I’m currently working on! Thanks for the chance!! Would love to make a green HO HO HO quilt for Xmas! LOVE that green and the projects in the book are so cute ~ oh please, pick me! I think Santa needs to pay a visit Down Under as I have been such a good girl and buying lots of precuts, but need inspiration to get sewing! I have really tried to be good this year…does trying count? That book is sweet sweet sweet. It could enhance and jump start the creative urges inside me. I would love to win as I already have this book and know how great it is but I would like to give it too my mum to feed her new found addiction (whoops sorry I mean LOVE) of patchworking. I would also love that green to make one of those fab trees for my kids. I have been so good this year that Santa knows I would make wonderful projects with the fabric and the book. I would love for Santa to leave this great gift in my stocking because I still have loads of gifts to make and am fresh out of new ideas. Help, Santa, please help! I would love to win. I am teaching full time this year and my sewing time has been cut drastically so I need ideas for the little time I have! We just bought a house and it is the first time I have had enough space to decorate. I have a lot of space to fill before Santa gets here! I would love to win this book! Have it on my wish list, but am trying to not buy anything for MYSELF until after Christmas! I’d like this in my stocking because I need to make something for my mother-in-law for Christmas (or her birthday, which is also in December) and she loves Christmas stuff. So I know I’d have a winner with a Christmas-themed gift. it’s not that i haven’t been good this year, or that i haven’t browsed the bake shop for the patterns i’d like to make … i have … i just like the book and the green jelly roll and would love to win them. I need some fabric for Christmas decorations and quilts for presents to family! I love the HO! HO! HO! quilt! What a fun decoration, Moda Trees! Everything I have seen about the book looks delicious! Oh how I adore Moda I’ve been a very good girl this year–purchasing Moda fabrics for all of my projects! I just adore the new book and it is already on my wishlist! The leaf green is fabulous too and also on my list of Christmas gifts. It would be so fun to win so I could check them off! I would love for Santa to bring me this book because my dear friend, Jane is one of the fantabulous featured chefs! I would love to win this book because I am a huge fan of all things Moda!! The designers and fabrics are always my favorites and the projects you have just shown would be so much fun to make. I thought the hohoho quilt was small and it was great to see it on a bed. How cute is that?? I’m always looking for ideas and new fabric. Would love to win. My stocking is pretty empty and I love Moda…all of it. A jelly roll would be such a welcome gift. I need Santa to leave this in my stocking because I need some really, really wonderful ideas for yummy gifts to make for Christmas giving! I am so far behind this year! Santa’s elf is going to be one busy girl and needs ALL the help she can get! Nothing says “I love you”more than a handmade gift! I’d love to have that jelly roll to make some place mats for next year (because there’s no way I’d get them done for this year). And I have been very good. Santa should leave me this because I could use some inspiration (and I want to make that HO HO HO quilt). What a fantastic book of ideas. I would love to have it in my library. No one beats MODA for their useful and fun projects. Santa knows I still believe in him and would love to have this in my stocking so I can make the HO! HO! Ho! quilt. I’m sure he would laugh and his belly would shake like a bowl full of jelly when he saw me sleeping under it on Christmas Eve. Why? Because there are so many wonderful ideas and it’s great inspiration. I’d love this to give me inspiration for my precuts! I want that in my stocking! 🙂 The book looks amazing! It will surely be a great bit of inspiration to me as a beginning quilter! Santa, I love that green and it would go great with my other favorite colors – purple and navy blue. Wouldn’t you like to see what I could do with this jelly roll and your new book? I desperately need this book to make some last minute gifts for some of my family who are depending on me to give them “handmade” gifts. So Santa, I have been good and I am not asking for anything else please see what you can do. Thank You and Merry Christmas. I follow through Google Reader and I would love to win this book because my precuts are threatening to take over! I would love Santa to leave it in my stocking so I can use the Jelly Roll to make Aussie Hero Quilts (using the JRR tutorial on my blog) and the book would give me some great reading. I would love to win this giveaway because Moda has never let me down yet, and I know this will be a great book and jelly roll! Thanks for the giveaway! I am a follower and love your products! I just saw the most beautiful display at my LQS today -candy, jelly rolls, charms and layer cakes by the dozens. I would be thrilled to receive these in my stocking – just to have some new stuff! It would make a great gift for my friend, (but i can keep the jelly roll right?). I am planning on doing a “homemade christmas” so this book would be perfect! I would love to find this in my Christmas stocking. It looks like a really fun book to use & who wouldn’t want a jelly roll! Why should Santa leave this in my stocking? Because I think it is awesome and I have been a good boy (mostly) And besides I won’t shoot my eye out with this present! I want Santa to leave this is my stocking because I’ve been a very good girl and I’d love to make some Christmas merries with them! That Christmas Quilt is to die for! It would look so cute on my bed! This would be such a blessing in my sticking since this is the first Christmas I am purposing to make every single gift on my machine. 🙂 Thank you and Merry Christmas to my favorite fabric company in the whole world! I would love to receive a nice surprise in the mail as a much welcome change from opening the letterbox to find those envelopes with windows which usually mean a bill to pay at this time of the year. It looks like there are lots of yummy things to make as gifts. Ho Ho Ho – I would love to have Santa grace me with this fabulous book (I do love that HoHoHo quilt) so that I can make my own green Christmas tree to put on the mantle. Thank you for the chance to be surprised by “Santa”. Merry Christmas! This is a fabulous green and would make terrific binding, all ready to go. I have been drooling over the teasers in that book for months! And I really need a great big Santa bag filled with Moda precuts! I could use the inspiration to get me thru the holidays 🙂 Thank You!!! I’d love Santa to leave this in my stocking so that I’d know what to do with the other items I hope get left in my stocking. I am dying to mod that into a Yo Ho Ho quilt for my fiance, and he loves green! I believe in Moda, therefore I think I should receive. My husband just lost his job and my 11 year old daughter and I love to sew and create. This would be such a treat to wrap up and give to her for Christmas. We would both have some joy to spread around our house. Merry Christmas Moda. I would love to gift that sweet book to my 14 year old daughter who has just started sewing! I think she would love to make one of those Cristmas trees! I want Santa to leave me this because I have been so good and the book has been on my wish list for so very long. Plus green is my hubbys favorite color. I am using a jelly roll for the first time right now, I am making it a Christmas quilt! I have a layer cake also that I am waiting to use, I just have to find the right pattern first! Green is my favorite color! Thank you for the chance to win! I love precuts & would love to win anything related to Christmas. I go totally crazy stitching gifts at this time of year. Thanks for this opportunity. I love it! I want Santa to leave it in my stocking so I can enjoy all of the projects! Santa needs a big bag to bring me a long arm….smile. I love the Ho Ho Ho quilt! Those green trees are really cute too! I am now a follower of The Cutting Table. Thanks for the chances to win. Who wouldn’t want a great book of craft and gift ideas using fabric. I love the idea of a jelly roll of the same colored fabric. just what’s needed to add some Christmas cheer! Thanks for the chance to win! Because we’ve just moved countries and so we’re starting everything Christmassy from scratch! I’m always looking for fun and stylin’ gift ideas! This combo is irrestible! I think you can never have enough fabric, what better to find in your stocking? Would love to have the Sweet Celebrations book. Love it. The HOHOHO quilt is wonderful. Would love a chance to win the book and jelly-roll. Merry Christmas!!!! Dear Santa. This is my favourite kind of baking. that HO HO HO quilt is fantastic! I would love this in my stocking so I can make that quilt! I would love this book, such a huge selection of great patterns and the jelly roll is a great kickstart on those patterns. Heard nothing but great things about this book! Would love to win a copy! Thanks! What a wonderful gift…please add my name to the ‘chance’ list! Thanks for the oportunity! Moda Santa? Well alright, Moda Santa I love my Moda fabric and I have just gotten started with your solid Jellyrolls. Please let me win so I can make more things before Christmas. Dear Santa, I want the Sweet Celebrations book in the Moda Bake Shop, because it offers dozens of bright, friendly projects that are perfect for my Moda precuts! As I’m catching up 🙂 I love this cook book! can I purchase it somewhere?